Dr Fernando's current research interests include developing needle-free, pain-free, skin patch vaccines. Influenza and human papilloma virus vaccines are used as model vaccines in these studies. 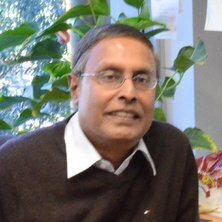 Dr Germain Fernando completed PhD at the University of Arizona, USA, and did post-doctoral research at the Baylor College of Medicine, Houston, Texas, USA, before joining the University of Queensland in 1989. He has been working in the field of vaccinology for the last 28 years. He has a H-Index of 36. Vaccinations using a novel needle-free, pain-free, skin patch. Although effective vaccines are available for combating diseases such as flu and cervical cancer, some people are reluctant to get vaccinated because of the fear of the needle. The needle and syringe first invented in 1853 is still being used because of the convenience to the person administering the vaccine. However this method has many disadvantages: Fear of the needle and the pain of injection, especially among children. Furthermore injection into muscle is less efficient than delivering the vaccine directly to immunologically active cells in the skin. We have designed a skin patch to overcome these disadvantages. We have recently published data to show potent immunity can be induced using very low doses of vaccine delivered by the skin patch. Reference: Fernando et al PLoS One 2010 April 21:5(4), e 10266. Kendall, Mark A., Fernando, Germain J., Chen, Xianfeng, Prow, Tarl and Corbett, Holly (2010). A method and associated apparatus for coating projections on a patch assembly. International Appl. Num. : PCT/AU2009/001366. Kendall, Mark, Fernando, Germain, Chen, Xianfeng and Prow, Tarl (2008). Coating Method. WO2009/079712. Khammanivong, V., Peters, T., Andrews, M., Leggatt, G. R., Frazer, I. H. and Fernando, G. J. (2005) The role of CD4 T help in multiple vaccinations when using minimal CD8 T cell epitope peptides. Tissue Antigens, 66 5: 415-415. Leggatt, G. R., Saunders, N., Dahler, A., Fernando, G. J., Matsumoto, K., Narayan, S., Linedale, R., Choyce, A. and Frazer, I. H. (2005) Transgenic expression of a viral oncoprotein exclusively in K14(+) epithelial cells results in peripheral but not central CD8 T cell tolerance. Tissue Antigens, 66 5: 475-476. Zhong, J., Matsumoto, K., De Kluyver, R., Fernando, G. J. P., Leggatt, G. R. and Frazer, I. H. (2004) Human growth hormone (hGH) presented by K14hGH-transgenic skin grafts induces a strong immune response but no graft rejection. Journal of Investigative Dermatology, 123 6: A113-A113. Stewart, Trina J., Smyth, Mark J., Fernando, Germain J. P., Frazer, Ian H. and Leggatt, Graham R. (2003) Inhibition of early tumor growth requires Jα18-positive (natural killer T) cells. Cancer Research, 63 12: 3058-3060. Gao, Feng Guang, Khammanivong, Vithagna, Liu, Wen Jun, Leggatt, Graham R., Frazer, Ian H. and Fernando, Germain J. P. (2002) Antigen-specific CD4+ T-Cell Help Is Required to Activate a Memory CD8+ T Cell to a Fully Functional Tumor Killer Cell. Cancer Research, 62 22: 6438-6441. Doan, Tracy, Herd, Karen A., Lambert, Paul F., Fernando, Germain J. P., Street, Michael D. and Tindle, Robert W. (2000) Peripheral tolerance to human papillomavirus E7 oncoprotein occurs by cross-tolerization, is largely Th-2-independent, and is broken by dendritic cell immunization. Cancer Research, 60 11: 2810-2815. Doan, Tracy, Herd, Karen, Street, Michael, Bryson, Gregory, Fernando, Germain, Lambert, Paul and Tindle, Robert (1999) Human papillomavirus type 16 E7 oncoprotein expressed in peripheral epithelium tolerizes E7-directed cytotoxic T-lymphocyte precursors restricted through human (and mouse) major histocompatibility complex class I alleles. Journal of Virology, 73 7: 6166-6170. Fernando, Germain J. P., Stewart, Trina J., Tindle, Robert W. and Frazer, Ian H. (1998) Th2-type CD4(+) cells neither enhance nor suppress antitumor CTL activity in a mouse tumor model. Journal of Immunology, 161 5: 2421-2427. Thomson, SA, Sherritt, MA, Medveczky, J, Elliott, SL, Moss, DJ, Fernando, GJP, Brown, LE and Suhrbier, A (1998) Delivery of multiple CD8 cytotoxic T cell epitopes by DNA vaccination. Journal of Immunology, 160 4: 1717-1723. Frazer, I. H., Leippe, D. M., Dunn, L. A., Liem, A., Tindle, R. W., Fernando, G. J. P., Phelps, W. C. and Lambert, P. F. (1995) Immunological responses in human papillomavirus 16 E6/E7-transgenic mice to E7 protein correlate with the presence of skin disease. Cancer Research, 55 12: 2635-2639. Nanopatch immunisation against pandemic influenza: improved immune responses at a reduced dose. 1). Delivering of vaccines using a novel skin patch that is needle-free and pain-free which induces potent immune responses. Study of mechanisms. 2). Developing Universal Influenza Vaccines that protect people from new strains of virus. 3). Translating the skin patch vaccine delivery system from animal models to human clinical testing. Frazer, I. H., Tindle, R. W., Fernando, G. J., Malcolm, K. M., Herd, K. A., McFadyen, S. M., Cooper, P. D. and Ward, B. G. (1999). Safety and Immunogenicity of HPV16 E7/Algammulin. In R. W. Tindle (Ed. ), Vaccines for Human Papillomavirus Infection and Anogenital Disease (pp. 91-104) Austin, USA: R.G. Landes Company. Zhong, J., De Kluyver, R., Leggatt, G. R., Fernando, G. J. and Frazer, I. H. (2005) Local inflammation is crucial for T cell mediated rejection of skin graft expressing foreign antigen. Tissue Antigens, 66 5: 600-600. Gao, Feng-Guang, Fernando, Germain J. P. and Liu, Wen-Jun (2005) The role of TH cells in memory CTL mediated tumor protection. Chinese Journal of Microbiology and Immunology, 25 4: 286-291. Liu, X., Leggatt, G., Fernando, G. J. and Frazer, I. H. (2005) Overcoming original antigenic sin to generate effective immune responses in antigen primed host. Tissue Antigens, 66 5: 481-481. Cole, Kenneth D., Fernando-Warnakulasuriya, Germain J. P., Boguski, Mark S., Freeman, Mark, Gordon, Jeffrey I., Clark, Wallace A., Law, John H. and Wells, Michael A. (1987) Primary structure and comparative sequence-analysis of an insect apolipoprotein: apolipophorin-Iii from Manduca-sexta. Journal of Biological Chemistry, 262 24: 11794-11800. Prasad, Sarvamangala V., Fernando-Warnakulasuriya, Germain J. P., Sumida, Motoyuki, Law, John H. and Wells, Michael A. (1986) Lipoprotein biosynthesis in the larvae of the tobacco hornworm, Manduca-sexta. Journal of Biological Chemistry, 261 36: 7174-7176. Fernandowarnakulasuriya, Gjp, Eckerson, ML, Clark, WA and Wells, MA (1983) Lipoprotein Metabolism in the Suckling Rat - Characterization of Plasma and Lymphatic Lipoproteins. Journal of Lipid Research, 24 12: 1626-1638. Fernandowarnakulasuriya, Gjp, Staggers, JE, Frost, SC and Wells, MA (1981) Studies On Fat Digestion, Absorption, and Transport in the Suckling Rat .1. Fatty-Acid Composition and Concentrations of Major Lipid Components. Journal of Lipid Research, 22 4: 668-674. Staggers, JE, Fernandowarnakulasuriya, Gjp and Wells, MA (1981) Studies On Fat Digestion, Absorption, and Transport in the Suckling Rat .2. Triacylglycerols - Molecular-Species, Stereospecific Analysis, and Specificity of Hydrolysis by Lingual Lipase. Journal of Lipid Research, 22 4: 675-679. Fernando, Germain J. P., Chen, XianFeng, Prow, Tarl, Crichton, Michael, Frazer, Ian H., Brown, Lorena E. and Kendall, Mark A. F. (2009). A novel Nanopatch that directly delivers influenza vaccine painlessly to antigen presenting cells in the skin and affords high dose reduction. In: Third International Conference on Modern Vaccines Adjuvants & Delivery Systems, Vienna, Austria, (). 28-30 October 2009. Crichton, M., Ansaldo, A., Chen, X., Prow, T., Tan, C., Fernando, G. and Kendall, M. A. F. (2009). Using velocity of application for targeted delivery of vaccines into skin using micronanoprojections. In: 36th Annual Meeting and Exposition of the Controlled Release Society, Copenhagen, Denmark, (). 18-22 July 2009. Chen, X., Crichton, M. L., Fernando, G. J. P., Kendall, M. A. F. and Prow, T. W. (2008). Micro-nanoprojection array patches for targeted vaccine delivery to skin: investigation of mechanical penetration interactions. In: Engineering and Physical Sciences in Medicine and the Australian Biomedical Engineering Conference, Christchurch, New Zealand, (). 16-20 November 2008. Frazer, IH, Dunn, LA, Fernando, Gjp, Tindle, RW, Leippe, DM and Lambert, PF (1995). Hpv16 E7 Transgenic Skin Is Not Rejected in E7 Immunized Mice. In: Journal of Cellular Biochemistry. , , (310-310). .
Frazer, IH, Lieppe, D, Lambert, P, Griep, A, Dunn, L, Tindle, RW and Fernando, G (1994). A Transgenic Mouse Model of the Immunobiology of Hpv16 Induced Cervical-Cancer. In: Journal of Cellular Biochemistry. , , (231-231). .
Fernando, Gjp, Tindle, RW, Frazer, IH, Stenzel, DJ, Merza, MS and Morein, B (1994). Small Synthetic Peptides as Vaccines - a Model Peptide Iscom Construct From Cancer-Associated Human Papillomavirus. In: Vaccines 94 - Modern Approaches to New Vaccines Including Prevention of Aids. 11th Annual Meeting on Modern Approaches to New Vaccines, Cold Spring Harbor Ny, (327-331). Sep, 1993. Frazer, IH, Lieppe, D, Lambert, P, Griep, A, Tindle, RW and Fernando, G (1993). A Transgenic Mouse Model of the Immunobiology of Hpv16 Induced Cervical-Cancer. In: Journal of Leukocyte Biology. , , (47-47). .
Fernando, GJ, Zhou, J, Tindle, RW and Frazer, IH (1993). Adjuvants Can Bias to Th1 or Th2 the Immune-Response to Hpv E7 Protein in Mice. In: Journal of Leukocyte Biology. , , (56-56). .
Dunn, LA, Tindle, RW, Fernando, GJ and Frazer, IH (1993). An Improved Immunoassay for the E7 Protein of Hpv16. In: Journal of Leukocyte Biology. , , (45-45). .
Fernandowarnakulasuriya, Gjp, Law, JH and Wells, MA (1986). Amino-Acid-Sequence of Insect Apolipophorin-III. In: Journal of Cellular Biochemistry. , , (72-72). . The role of T-help in maintenance of memory cytotoxic T cells.